In testimony before the House Intelligence Committee on Tuesday, the head of the National Security Agency, Gen. Keith Alexander, said the government surveillance programs which have set off a national debate had helped prevent more than 50 terrorist “events” since Sept. 11, 2001. Many Americans appear to accept that defense of the program as true, according to a survey conducted just days before the hearing. A majority (53%) think the government’s collection of telephone and internet data has helped prevent terrorist attacks, while 41% say it has not. 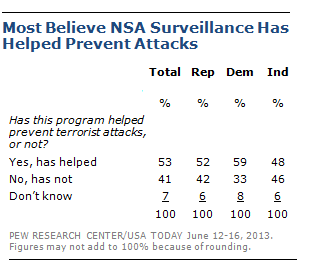 But while a majority agree the program has helped prevent terrorist attacks, the public is still split on its view of the surveillance programs: 48% approve of the collection of data and 47% do not.